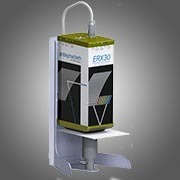 The ERX30 is the first spectrophotometer with 45°:0° geometry and adjustable UV content. This allows an exact measurement of the base white and the optical brightening agent (OBA) in the paper. Also critical colors and demanding applications can be measured with high quality based on the excellent spectral resolution of 1 nm. The wide spectral range of the ERX30 from 330 nm to 730 nm gives excellent information not only in the visible range but also in the UV area. The measurements have an excellent correlation with the visual assessments because of the 45°: 0° geometry, which is standard in the printing industry and also for the on-line measurement in the machine. Customers and suppliers will talk the same "color language"!